Tiles, love them or loathe them? We have a big debate in the office on those little squares of porcelain, some of us love the feel and look a tile can bring to your kitchen or bathroom whilst others are not so keen! In this post we look at different styles of tiling and tile alternatives such as aqua panels. Which would you choose? In recent years tiles have gained popularity mainly due to a surge in patterned tile sales, with consumers using them on floors and walls to make a bold statement in many areas of their homes. From chevron or subway to coloured grout the possibilities are endless with tiles, they are an easy way to make your kitchen unique and personal. See our gallery below for our pick of some of the jazziest tiles around. But what are the alternatives if you are bored of scrubbing grout in between tiles? We have an increasing number of people asking us to fit aqua panels in their bathrooms and kitchens for a hygienic , easy to clean alternative. 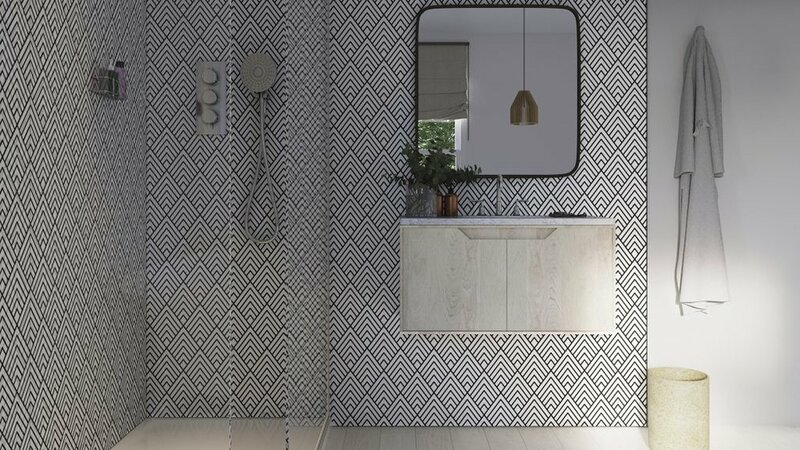 Over the past few months wall panelling specialists ‘Shower Wall’ have come up with some gorgeous new designs which rival the personality of tiles. We have chosen a few personal favourites of ours in the gallery below. Pop in to see us at the showroom to discuss any of the products discussed today and how we can help you create your perfect home.